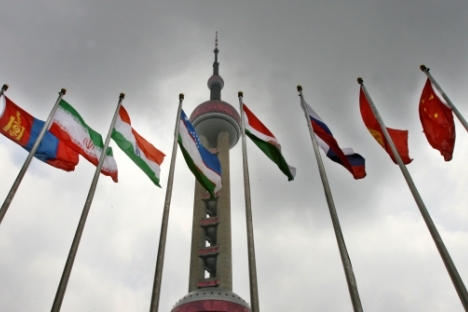 Flags of SCO members in Shanghai in 2014. Five countries have applied to join the Shanghai Cooperation Organization (SCO), its Secretary General Rashid Alimov said on June 13. Alimov said more applications to join the SCO could be received soon, as another Southeast Asian nation showed interest at the Russia-ASEAN summit in Sochi in May. Controversies between India and Pakistan will not be brought to the format of the SCO, Alimov added. “We see no risk of controversies between India and Pakistan going to the SCO,” he said. Consultations with India and Pakistan have lasted for more than a year and both countries have been SCO observers for 11 years and know the organization's rules well, Alimov said. A document on the accession of India and Pakistan to the SCO should be signed at the Tashkent summit in June. This will be the “beginning of a new stage” in the transition of India and Pakistan from SCO observers to fully-fledged members. India and Pakistan are due to sign over 30 documents adopted by the SCO over the last 15 years. Alimov met with a group of journalists from 18 countries that are either observers or dialogue partners of the SCO at the organization's headquarters in Beijing. The Chinese committee for good neighborliness, friendship and cooperation organized the journalists' visit on the occasion of the SCO's 15th anniversary. Read more: Will Russia integrate into the Western world, post-sanctions?